I am not a forest ecologist. OK, that’s not entirely true, as demonstrated by the strapline of this blog and the evidence on my research page. Nevertheless, having published papers on entomology, theoretical ecology and snail behaviour (that’s completely true), I’m not just a forest ecologist. Having now published a paper on barnacles, one could suspect that I’m having an identity crisis. When a biologist is asked what they work on, the answer often depends on the audience. On the corridor that hosts my office, neighbouring colleagues might tell a generally-interested party that they work on spiders, snails, hoverflies or stickleback. Likewise, I usually tell people that I work on forests. When talking to a fellow ecologist, however, the answer is completely different, as it would be for every one of the colleagues mentioned above*. If you walked up to me at a conference, or met me at a seminar, I would probably say that I work on spatial self-organisation in natural systems. If you were likely to be a mathematician or physicist** then I’d probably claim to study the emergent properties of spatially-structured systems. I might follow this up by saying that I’m mostly concerned with trees, but that would be a secondary point. What I and all my colleagues have in common is that we are primarily interested in a question. The study organism is a means to an end. We might love the organism in question, rear them in our labs, grow them in our glasshouses, spend weeks catching or watching them in the field, learn the fine details of their taxonomy, or even collect them as a hobby… but in the end it is the fundamental question that drives our work. The general field of study always takes priority when describing your work to a fellow scientist. Behold the high-tech equipment used to survey barnacles. This is the kind of methodology a forest ecologist can really get behind. The work on barnacles was done by a brilliant undergraduate student, Beki Hooper, for her final-year project***. The starting point was the theory of spatial interactions among organisms most clearly set out by Iain Couzin in this paper****. His basic argument is that organisms often interact negatively at short distances: they compete for food, or territorial space, or just bump into one another. On the other hand, interactions at longer ranges are often positive: organisms are better protected against predators, able to communicate with one another, and can receive all the benefits of being in a herd. Individuals that get too close to one another will move apart, but isolated individuals will move closer to their nearest neighbour. At some distance the trade-off between these forces will result in the maximum benefit. Iain’s paper was all about vertebrates, and his main interest has been in the formation of shoals of fish or herds of animals (including humans). I’m interested in sessile species, in other words those that don’t move. Can we apply the same principles? I would argue that we can, and in fact, I’ve already applied the same ideas to trees. What about barnacles? They’re interesting organisms because, although they don’t move as adults, to some extent they get to choose where they settle. Their larvae drift in ocean currents until they reach a suitable rock surface to which they can cling. They then crawl around and decide whether they can find a good spot to fix themselves. It’s a commitment that lasts a lifetime; get it wrong, and that might not be a long life. If you know one thing about barnacles, it’s probably that they have enormously long penises for their size. Many species, including acorn barnacles, require physical contact with another individual to reproduce. This places an immediate spatial constraint on their settlement behaviour. More than 2.5 cm from another individual and they can’t mate; this is potentially disastrous. Previous studies have focussed on settling rules based on this proximity principle. They will also benefit from protection from exposure or predators. On the other hand, settle too close to another barnacle and you run the risk of being crushed, pushed off the rock, or having to compete for other resources. Barnacles can be expected to interact negatively at short distances, but positively at slightly longer distances. This disparity in the ranges of interactions gives rise to the observed patterning of barnacles in nature. What Beki found was that barnacles are most commonly found just beyond the point at which two barnacles would come into direct contact. They cluster as close as they possibly can, even to the point of touching, and even though this will have the side effect of restricting their growth. Furthermore, Beki found that dead barnacles had more neighbours at that distance than would be expected by chance, and that particularly crowded patches had more dead barnacles in them. There is evidence that this pattern is structured by a trade-off between barnacles wanting to be close together, but not too close. On the left, the pattern of barnacles in a 20 cm quadrat. On the right, the weighted probability of finding another barnacle at increasing distance from any individual. A random pattern would have a value of 1. This shows that at short distances (less than 0.30 cm) you’re very unlikely to find another barnacle, but the most frequent distance is 0.36 cm. Where it crosses the line at 1 is where the benefits of being close exceed the costs. Hence the title of our paper: too close for comfort. Barnacles deliberately choose to settle near to neighbours, even though this carries risks of being crowded out. The pattern we found was exactly that which would be expected if Iain Couzin’s model of interaction zones were determining the choices made by barnacles. When trees disperse their seeds, they don’t get to decide where they land, they just have to put up with it. The patterns we see in tree distributions therefore reflect the mortality that takes place as they grow and compete with one another. This is also likely to take place in barnacles, but the interesting difference lies in the early decision by the larvae about where they settle. Where do we go from here? I’m now developing barnacles as an alternative to trees for studying self-organisation in nature. The main benefit is that their life cycles are much shorter than trees, which means we can track the dynamics year-by-year. For trees this might take lifetimes. We can also scrape barnacles off rocks and see how the patterns actually assemble in real time. Clearing patches of forests for ecological research is generally frowned upon. The next step, working with Maria Dornelas at St. Andrews, will be to look at what happens when you have more than one species of barnacle. Ultimately we’re hoping to test these models of how spatial interactions can allow species to coexist. Cool, right? The final message though is that as an ecologist you are defined by the question you work on rather than the study organism. If barnacles turn out to be a better study system for experimental tests then I can learn from them, and ultimately they might teach me to understand my forests a little bit better. * Respectively: Sara Goodacre studies the effects of long-range dispersal on population genetics; Angus Davison the genetic mechanisms underpinning snail chirality; Francis Gilbert the evolution of imperfect mimicry; Andrew MacColl works on host-parasite coevolution. I have awesome colleagues. ** I’ve just had an abstract accepted for a maths conference, which will be a first for me, and slightly terrifying. I’ve given talks in mathematics departments before but this is an entirely new experience. *** Beki is now an MSc student on the Erasmus+ program in Evolutionary Biology (MEME). Look out for her name, she’s going to have a great research career. Although I suspect that it won’t involve barnacles again. This entry was posted in Uncategorized and tagged barnacles, research, trees on March 7, 2016 by Markus Eichhorn. Well… it depends. You might think that I’m being facetious here. When I ask this of my students, they immediately suspect that it’s a trick question. After all, I do describe myself as a forest ecologist. But if you pinned me down and forced me to respond then I would struggle to give a clear answer. In this post I’ll try to explain as clearly as I can, and thereby demonstrate that we have a real, serious problem. Let’s get the etymology out of the way first. In Medieval English the word forest did not refer to a place with trees. Its original meaning was one of the King’s hunting grounds which were managed particularly to maintain populations of deer. Many of these contained trees, but that wasn’t their distinguishing feature. Some were actually heathlands. To this day Exmoor forest hardly contains any trees. Contrary to popular misconception, that’s not because they were cut down — they were never there in the first place. Here in Nottinghamshire I live only a short drive from Sherwood forest. Myths of outlaws in the wild woods are doubly fictional; neither Robin Hood nor his primeval haunt have any firm basis in historical fact. This has been a managed landscape for many thousands of years. A quick look at everyone’s favourite tree, the Major Oak, gives the game away. Major Oak in Sherwood Forest in 2006 by Marcin Floryan. This is not a tree that grew beneath a closed, dark canopy. Oaks in such situations grow tall and slender, forced upwards by strong competition for light. The north-east of the United States is carpeted in young oak forests, none of which contain trees shaped anything like the Major Oak. Its low spreading branches tell of a lifetime spent in a wide open area, surrounded by heathland, which has only in the last century been filled in by the mass of birch trees which now surround it. These birches are themselves a signifier; birch only grows in bright, open habitats when no browsers are around to eat its seedlings. If you wished to restore Sherwood Forest to how it looked at the time of Robin Hood, the first thing to do would be to cut down most of the trees. The origin of the word ‘forest’ is therefore not much help in deciding what one is. The modern understanding is of an area covered in trees, so that’s a better place to start. But what is a tree, and how many of them does it take to make a forest? Defining a tree isn’t straightforward either. Botanists, foresters and ecologists will all give different answers. Here’s my rather technical definition: a tree is any plant actually or potentially forming a free-standing monopodial stem of at least 1.3 m in height, with secondary thickening, and reaching a height of at least 5 m.
Let me parse that quickly so you can see where I’m coming from. The opening caveat ‘actually or potentially’ is necessary because it allows for the fact that many plants are capable of growing into trees, but haven’t got there yet (they might be young) or are prevented from doing so (e.g. by regular grazing or coppicing). A bonsai oak is still the same species as a giant oak, it’s just been constrained by a tiny pot. Free-standing is an attempt to keep out (most) lianas, which are structural parasites. 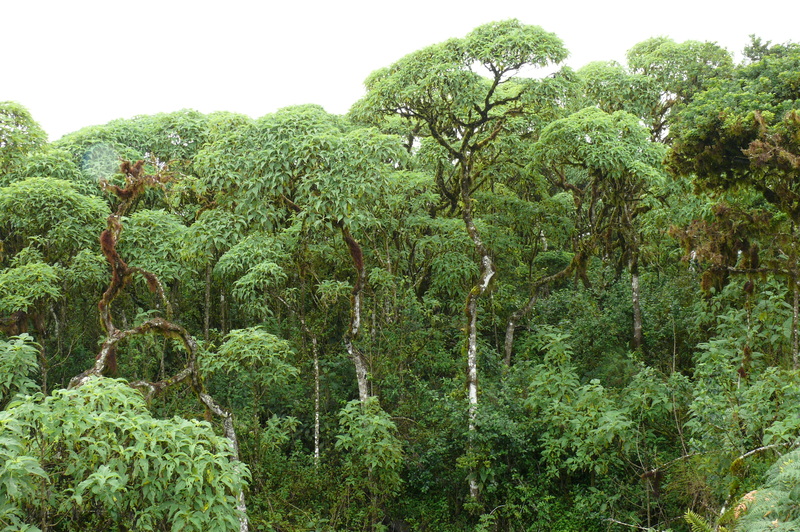 Monopodial means having a single, dominant stem; this separates trees from shrubs, which have many stems and tend to branch below 1.3 m. As for the secondary thickening, that implies the existence of bark and other woody tissues, and excludes giant herbs such as bananas. The height of 5 m is arbitrary and intended to filter out any remaining shrubby species. As an aside, almost any plant species is capable of evolving into a tree. Nowhere is this more obvious than on oceanic islands, where the chances of reaching them are slim, and therefore whichever plant is lucky enough to get there first can evolve into a dominant tree. 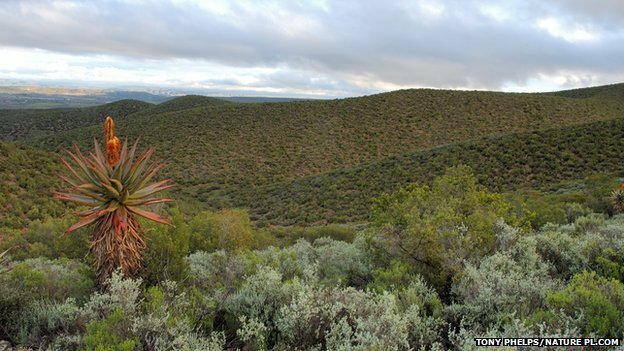 On the Juan Fernández islands or in Macaronesia the native trees are actually lettuces, while tree sunflowers dominate forests in St Helena and the Galápagos, and tree silverswords in Hawaii show little resemblance to their weedy ancestors. Scalesia pedunculata. It’s a Galapagos tree, and also, basically, a daisy. By Haplochromis CC BY-SA 3.0 via Wikimedia Commons. There will always be some in-between cases but we’ll leave them to the specialists. Some lianas start their lives as small trees; some species can grow as either trees or shrubs; no-one really knows what to call a hemi-epiphyte like a strangler fig. Nature doesn’t easily fit into our boxes. Still, this gives us something to work with. It also ends up including species like oil palm, which are farmed as cash crops, and no-one would want landscapes dominated by them to be defined as forests. But we have to draw the line somewhere and specific chauvinistic exclusions would make a mockery of scientific impartiality. It’s worth pausing briefly to note that the definition does create some perverse consequences. It’s not too dissimilar to that used by the FAO (Food and Agriculture Organization of the United Nations). A major bone of contention in their assessment of forest cover is the acceptance that any land which could grow trees is still a forest until its land use category changes. Completely burnt to the ground? Still a forest. Clear-felled? Still a forest. So long as trees are expected to grow there again one day, the FAO will call it a forest, even if there aren’t any there right now. How many trees makes a forest? One common approach is to look at how much of the land surface area is covered by tree crowns, and I would personally draw the line around 40% (based on Sasaki & Putz 2009). Note that this is more restrictive than the definitions used by the UNFCC (United Nations Framework on Climate Change) or FAO. All this causes further problems. My criterion includes things like orchards and rubber plantations, which are not forests by any folk definition. Likewise it excludes vegetation types with low tree densities (e.g. savannahs or dehesa) and shrublands. Some will get very sensitive about this because of the popular perception that conserving forests is the most crucial issue. I do not mean to devalue these landscapes, but would argue instead that these deserve separate treatment rather than attempting to cram them into an all-inclusive definition of forests. South African fynbos. A conservation priority, but calling it ‘forest’ doesn’t help. Why does this matter? Well, deciding what a forest is makes a major difference in determining how much forest there is in the world. A new paper by Sexton et al. in Nature Climate Change points out that varying your criterion for tree cover from 10 to 30% changes the amount of forest recognised globally from satellite imagery by 6%. In other words, it’s a difference in area the size of China. In the tropics alone it represents a difference of 45.2 Gt of carbon. That’s a much bigger discrepancy than anything caused by arguments over defining a tree, or whether we should include rubber plantations. All those fine details drift into irrelevance. While different countries are allowed to decide what they call ‘forest’ there will be political motivations to move the goalposts. If we’re trying to battle climate change by tracking the amount of carbon locked up in forests, or save species, or maintain ecosystem services, it’s pretty crucial to find out how much forest we have. When NGOs bemoan ‘forest loss’, or governments declare successes in ‘forest protection’, you should maintain a healthy degree of scepticism about what they’re actually recording and where their figures are coming from. If we are to meet the Aichi Biodiversity Targets or use forest stocks to compensate countries for storing rather than releasing carbon through the REDD+ program then what we call a forest matters. It matters politically, financially, socially. Global forest cover as detected from satellite data depending on whether one uses 10% (top) or 30% (bottom) land cover by trees as the criterion for defining forest (originals from NASA Earth Observatory, http://earthobservatory.nasa.gov/IOTD/view.php?id=86986&src=eoa-iotd). All this argument leads to one basic conclusion, which is that the word ‘forest’ is a blunt and imprecise tool when it comes to describing the things we care about. Forests include areas that are old-growth, degraded, secondary or plantations, all of which have different sets of values depending on your perspective (see Putz & Redford 2009 for a great discussion). It is possible for serious degradation of habitats to take place without them ever ceasing to be called ‘forests’, and a dichotomy with ‘non-forest’ is unhelpful in documenting or preventing this. Forests are not merely present or absent. Let’s just agree that many things can be called forests and stop arguing over the definition. More important is to ask why we care about forests, and start measuring the values that matter to us such as species, carbon, or services. Then, at last, we might be able to move past this distraction. This entry was posted in Uncategorized and tagged forests, trees on November 18, 2015 by Markus Eichhorn. Towards the end of last week the phone started ringing. I’d been expecting this for some time. The news had just come through that ash dieback had been discovered in Nottinghamshire, not far down the road from my office. This is something I had anticipated several years ago, though I make no claim of special prophetic gifts. It was obvious that it would. The disease has spread systematically from the east of Europe, sweeping unimpeded right the way to Holland (see the Forestry Commission website for an excellent summary of the disease and its background). It was only a matter of time before it made it to the UK, and once established there was no keeping it from Nottinghamshire. This despite the British government convening a meeting of COBRA, the national emergencies committee, in an effort to be seen to be Doing Something. They might as well have objected to clouds. The reason I was suddenly being called was the estimate by Nottinghamshire County Council that 40,000 trees might need to be removed in the next five years. As ever, journalists settle on the story first then try to find some talking heads to fill in piece with some choice quotes. In every phone conversation it quickly became clear that they wanted me to say how terrible this was so that they could set up a conflict with the Council’s plan. “Academic says save our trees!” All of them finished the conversation disappointed with my failure to play the game. This culminated in an appearance on Notts TV alongside a friend from Notts Wildlife Trust in which they were hopeful that one of us would bite. The trouble is, we both agreed. The actual numbers are an estimate, and not worth fighting over, but the basic principle remains. Trees are going to have to be cut down. Why am I so willing to accept this drastic intervention? The simple truth is that most of these trees are going to die anyway; the Danish experience suggests as many as 90% will eventually succumb to the disease. Most of these have been planted, often from commercial (and frequently non-native) stock. Ash is favoured as a screening tree along roadsides and around developments because it grows tall and fast. Not all trees are equal, and a young planted ash tree ranks pretty low in terms of its conservation value, relative to say an ancient yew or a small-leaved lime. Trees that are sick and dying are not merely an eyesore, they’re a risk, especially along roadsides, paths and bridleways. Land owners would be legally liable if they fell on someone. The Council is being perfectly sensible and their press release was simply preparing people for the worst. While some have capitalised on the flurry of interest by launching projects to characterise the ash genome or develop resistant trees, these aren’t going to make a difference in even the medium term. I can’t blame people for using a news story to get some research funding, but these are not solutions to the problem. The trees are going to go, and the landscape of the UK will be changed for at least a generation. The issue that really matters is what we choose to do next. Where ash trees succumb on private land or in closed woodlands, they should be left alone to die and fall. This will create a large resource of dead wood which will benefit a wide range of species, especially insects and the birds which feed on them. Where large trees fall, they will create gaps in forests that other species will benefit from. There are many woods (particularly here in Nottinghamshire) that only exist because ash colonised abandoned fields following WW2 when marginal land was pressed into production. These are now 70 years old and have plentiful seedlings beneath them — oak, field maple, hazel, wych elm — all of which will grow to fill the place of the missing ash. Our woodlands will change, but nature is dynamic and ceaseless change is a rule. Their composition was never natural in the first place (if natural is taken to mean wild and unaffected by human influence), so it’s hard to make a case for their preservation or restoration. Let’s see what happens. It’ll be interesting. In urban areas, people appreciate the presence of trees, and will miss the ash when they are gone. The question we should be asking is: what will we plant in their place? Instead of introduced species (e.g. London plane, which isn’t from London at all) or those which offer little to wildlife (e.g. whitebeam), why not take a longer-term approach and plant a variety of native species that will bring more wildlife into our towns along with variety and interest? What would you like your grandchildren to be walking under in a century’s time — another monocultural row of ash, or a lane of oak, beech, hornbeam, lime and black poplar? The death of our ash trees will leave a gap in our landscape. But any gap is also an opportunity. This entry was posted in Uncategorized and tagged ash dieback, ash tree, Nottinghamshire, trees on October 22, 2014 by Markus Eichhorn.